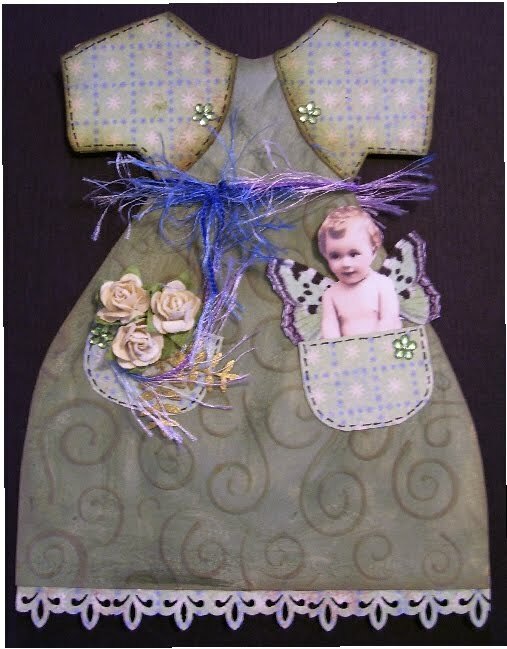 Over at Margaret's blog the dress challenge has really sparked a worldwide creativity challenge. I figure better late than never and I finally found some time to complete my March dress. I know April is already half over but art is not a hurried thing with me, I need time and space for some projects and when I started this dress I had no idea where I was going with it. I dry embossed some cardstock then on a shopping trip a while back I found some little tubes of paint that is really used for painting on fun foam but it had some wonderful metallic colours and being in a Liquidation store of course the price was right. I painted my dress green then rubbed some ink on the raised areas. I found some scrap paper to make the little bolero jacket and pockets. used a paper boarder punch for the bottom and stuffed the pockets with my little adornments. The little angel I thought would look cute sitting inside the pocket, she is watching everything that is going on. Well that's it for today, thought I had better post this, not sure anyone will come look now that we are into April but at least I got this one done. Now onto April, hmmmm birds and butterflies might be something to work on. Good night and thanks for dropping by, oh and I love reading your comments. Adorable dress, Les! Love the colour scheme. Love, love, love the dress Lesley....love the fairy in the pocket!! !